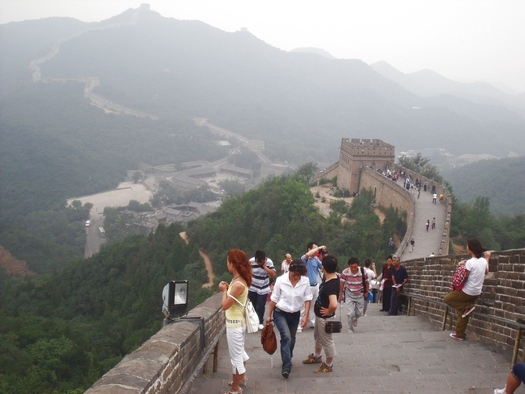 Climbing the Great Wall of China at Badaling: What is the experience actually like? Here, with comments, are public domain photos of sights, funny signs, and people on a climb. There are beautiful sights to see, and the steepness of the wall encourages lots of rest stops to look. 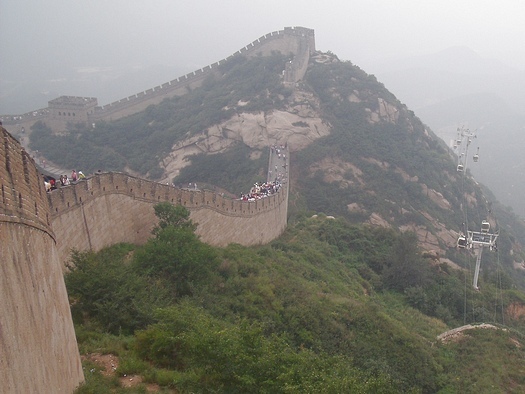 On the previous page documenting this climb up the Great Wall of China, you saw three towers. Here we have climbed beyond the third of those. Look back and you see how far we've come. The Great Wall you see snaking up the far side is the less-traveled branch that we did not take. At the foot of it you see the flag square where we bought tickets and started our climb. About midway up, we see the sliding car ticket office. The sliding car looks a cross between a roller coaster and a kiddy train. For 30 yuan (about US$5) you can ride up or down and skip a large part of the rough climbing. It's a reasonable option and some people report that it is mildly exciting, though its speed is nowhere near a fairground roller coaster. Part of the excitement, I'm sure, is wondering how well the thing is built and whether it could lose its brakes any moment. Looking further up the Great Wall of China from here, we see the cable car. Its terminus is further up the wall than the sliding car but there is still a couple of hundred metres to hike to get to the top after exiting the cable car. Look carefully at the section of wall you see here and you'll notice that part of the wall is smooth but the steepest parts have stairs. 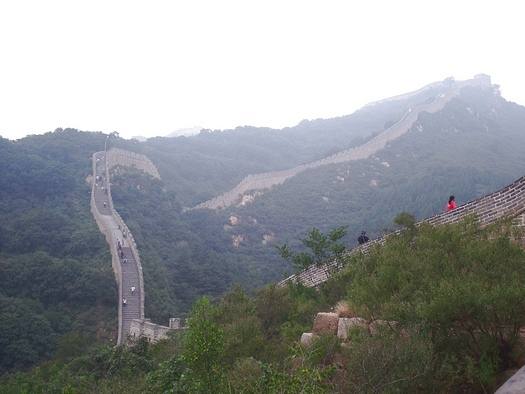 Here is one of the steeper smooth parts of the Great Wall of China. Look at the angle of the two men! People were walking very carefully in parts like this, and in the rain this would be a downright dangerous stretch. 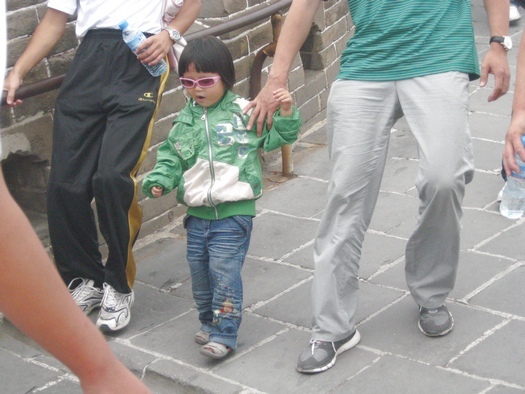 There are occasional "speed bump" protrusions like you see just in front of the little Chinese girl. 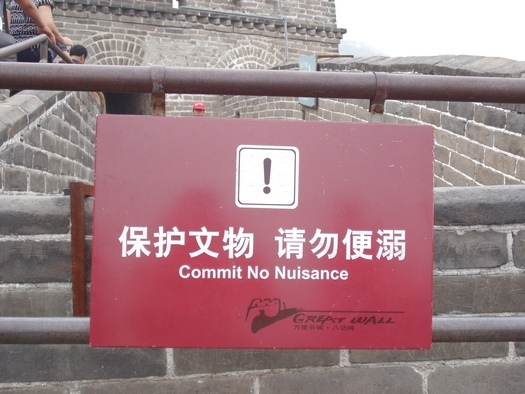 I collect pictures of Chinese funny signs with strange or incomprehensible messages. The meaning of this one is unmistakable, but would a native English speaker ever think of saying it this way? Nope. I'm sure that many of the sentence structure and vocabulary choices I use in speaking Chinese are similarly amusing to my Chinese friends. Isn't language fun? 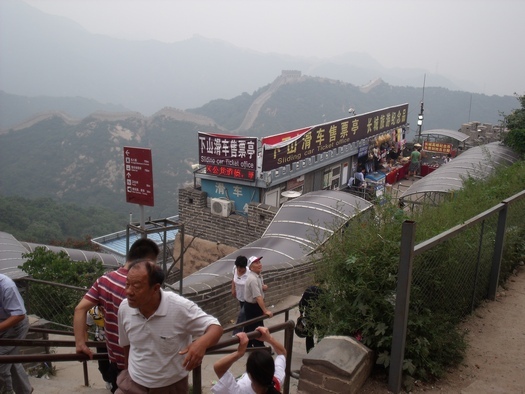 Now we're getting quite near the top of the Great Wall of China at Badaling. On the right side you see where the cable car lines disappear into the side of the mountain to get to their terminus. You'll also notice where the wall is discontinuous below. There's a massive rock outcrop that you have to walk around beside the wall. It strikes me as a militarily weak point, but remember, this wall is a reconstruction so maybe the original handled that section differently. Finally! Here we are at the top. 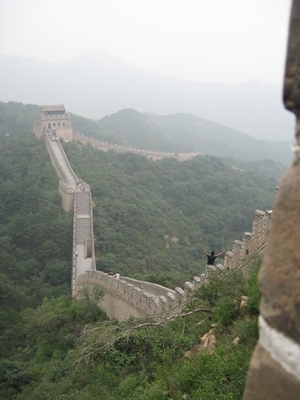 This is as far up as you can go on this part of the wall at Badaling. Notice that the three guard tower entrances are all bricked in. There is a steady stream of people getting their picture taken on the top step of this. This was a day when the wall didn't have many tourists - I imagine this part would be almost gridlocked with people on the busy days. I have, by the way, been caught in a people gridlock in a Chinese alley. Everybody and everything, including bicycles, carts, pedestrians, and a dump truck was blocked by something else. Nobody moved. Me being the impatient foreigner, I got up on a cart and started directing traffic to get some flow. I had to stare down one guy who wanted to jump into a cleared spot in front of him which would have re-gridlocked the bunch. After a minute or so, some motion resulted and I was able to get through, but I'm sure it gridlocked again soon after I left. Another thing to notice about this top tower at the wall is the security camera. 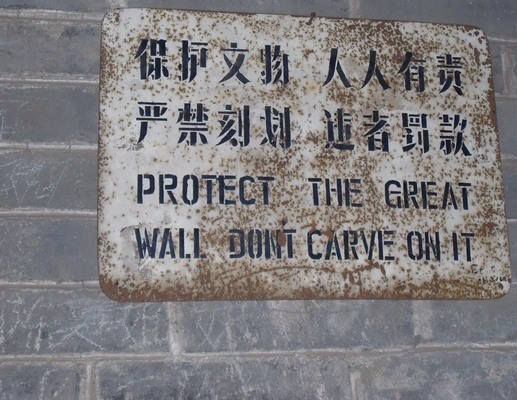 These are all over the place in modern China. Are you being watched? Yes. In streets, classrooms, stores,... everywhere. Get used to it. Not far before the top tower the Great Wall of China branches off, as you see here. There is a lot more climbing to do if you have a mind for it. You can also take the cable car down though, if you're tiring out. The darker parts of the top of the wall are where there are stairs. The lighter parts are the rest of it. As you can guess from the number of stairs, the part ahead is very steep in many places. Here you see one of the toughest stretches, looking back on it. Look at the angle on the wall battlements. Some steps are twice as tall as they are wide, meaning the incline is much more than 45 degrees! 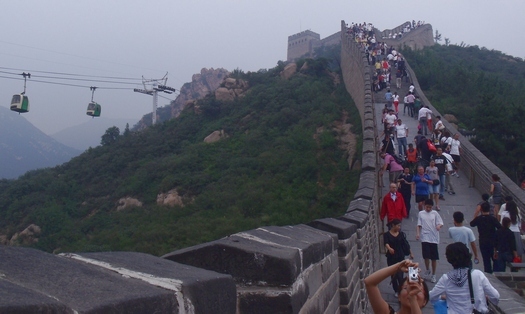 There are few tourists on this part of the wall. One scary thing about this is that there is no indication that you can get off the wall at the other end. With some people walking toward me, I was wondering if I'd have to turn around and do these steep parts again. Fortunately, I found there is a way off the wall without retracing steps, near the bottom station of the sliding car. 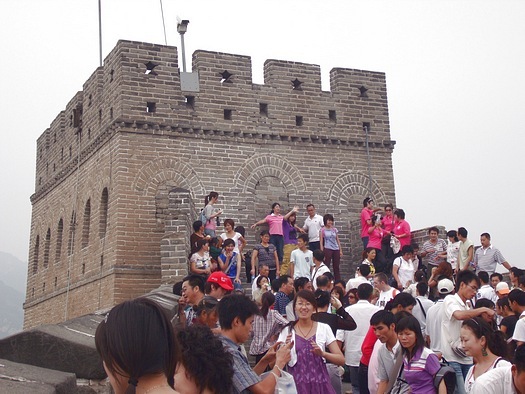 There are enough tourists on this part of the Great Wall of China, however, for one of the towers to have a couple of souvenir stands. You can get your cheesy "I climbed the wall" plaques right under this, an old rusty sign surrounded by evidence that people ignore it.